Who the *%@! is Bryan Rust?! Rust has been a shock in the Penguin's organization since he was brought up from Wilkes Barre last season. At the very least, he is a close second (perhaps even tied) for the title of most shocking behind Conor Sheary. Rust has made a big impact on the team even in the small amount of time he has been playing at this level. So much so that at the end of the 2015-16 regular season, the organization rewarded him with the Rookie of the Year award. However, people keep asking who he is as if they are not aware of his skill and play making ability. Supposedly it is a joke but with what he has been able to do for the team as well as the impact he continues to have game after game, it is one that has become tired and needs to stop. After all, you don't see people asking who Matt Murray is, or Scott Wilson or Tom Kuhnhackl yet these three came up to the "big leagues" around the same time as Rust and, as far as the forwards are concerned, Rust has been more effective. Admittedly, there was not much "wow" expected from Bryan Rust. Upon his call up, he was more or less written off by many as nothing more than a typical fourth line grinder. Someone who would do the dirty work, score a few lucky goals but not really have the stats or the playing ability to make him a name worth thinking about twice. In an article posted last season, I spoke at length with columnist Russ Hryvnak (formerly of DKPghSports) regarding Rust. Hryvnak made a point of stating that Rust was the quiet type, not one to get in the face of opponents, and fits more onto a checking line and won't be one to be a big game changer or play maker. By season's end, Rust had not only proven Hryvnak wrong, but has made nay-sayers stand up and take notice. As the 2015-16 campaign drug on, Rust grew into more of a little agitator. He ran his mouth at defending opponents and was not afraid to throw his body around and allow his presence be felt. As the playoffs started, Rust ramped up his game offensively. On the day he raised the Cup with his team, Rust would end up having six goals, three assists, and a 60% face off win percentage. To put that in perspective, Evgeni Malkin and Sidney Crosby (both of which also had six goals but more assists), had a 48.4 and 52.4 FO%, respectively. Rust would also see time playing on the second line with Evgeni Malkin, a spot he rightfully earned and deserved. 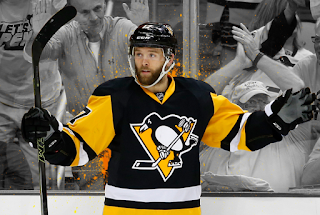 On May 26, Rust would become a Pittburgh hero. Notching both goals including the eventual tie breaker, he (along with a strong defensive stance) lead the Penguin's to the Stanley Cup Finals versus the San Jose Sharks. His impactful play has not slowed since re-joining the team late October after an undisclosed injury required extended recovery time. Incidentally, Rust is the only player of the four forwards brought up from the minor league club (S. Wilson, T. Kuhnhackl and C. Sheary the other three) to play in all games when not out for injury. Has not been a healthy scratch (or put in "time out") once. The same cannot be said for the others. That alone should speak volumes for the amount of trust the coaching staff has in their young winger. 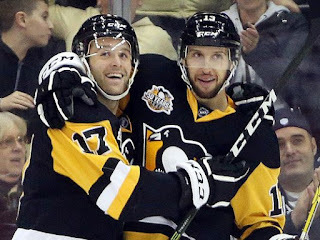 Rust has earned a place playing on both the third line with Nick Bonino and at times, is reunited with Malkin on the second line when the roster needs a shake up. He currently has five goals (one behind Sheary), eleven assists and was even been involved in a scrap earlier this season (something not even myself thought would happen). He has the speed Head Coach Mike Sullivan loves and will shoot the puck from anywhere and everywhere when he can. He helped raised funds for Men's Health Awareness during the month of November with his fantastic "Rust-ache" in honor of his father, a prostate cancer survivor. He plays without fear, and now has his first NHL Hat Trick earned by scoring three different ways (thereby proving that, yes, he can hit a wide open net). So WHO the *%@! is Bryan Rust?